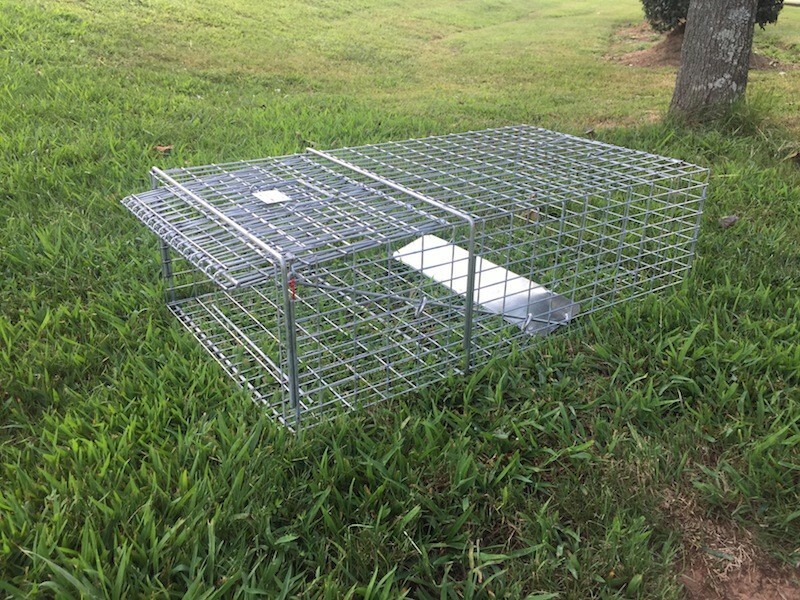 TRAP DESCRIPTION: Great trap for catching turtles one at a time. Trap measures 132" Long by 18" Wide by 9" Tall. Turtles reluctant to enter the MULTIPLE CATCH turtle trap will readily enter this design because the door will be set "open" like standard animal traps. Place bait behind the trip pan to lure target turtles inside by baiting with something the turtles are eating. Typically this will be some kind of food found locally. It could be a type of plant, fruit, vegetable or fish. WHERE TO USE IT: Mostly used on land, this trap is best set along shore lines of water which is serving as a host for turtles. Try sets with entrance doors pointed into the water as well as parallel to the shore. Whichever set catches turtles faster should then be used all the time. They can also be used on floating rafts since many turtles will access these to sun themselves. Shallow water ditches, which have no more than 2-4 inches of water, also make good places to make a set. RATE OF APPLICATION: As is the case with most live traps, the more installed will help to provide faster and better results.